With the ASP.NET Core 2.0 release we’ve added many new features to make building and monitoring web apps easier and we’ve worked hard to improve performance even more. More details about these features are available in our follow up post about ASP.NET Core features. 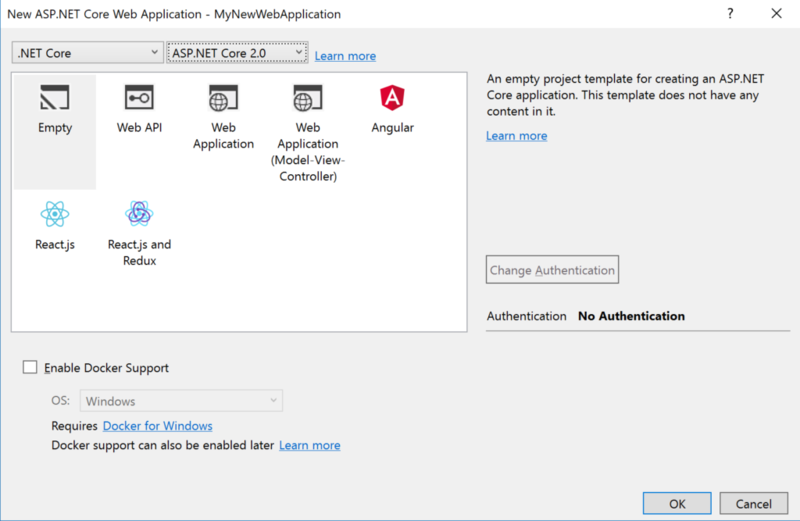 ASP.NET Core 2.0 runs on both .NET Framework 4.6.1 and .NET Core 2.0, so you will need to update your target framework in your project to netcoreapp2.0 if you were previously targeting a 1.x version of .NET Core. Next, we recommend you reference the new Microsoft.AspNetCore.All metapackage instead of the collection of individual Microsoft.AspNetCore. * packages that you previously used. This new metapackage contains references to all of the AspNetCore packages and maintains a complete line-up of compatible packages. You can still include explicit references to specific Microsoft.AspNetCore. * package versions if you need one that is outside of the lineup, but our goal is to make this as simple a reference as possible. What happens at publication time? We know that you don’t want to publish the entire AspNetCore framework to your target environments, so the publish task now distributes only those libraries that you reference in your code. This tree-pruning step should help make your publish process much smoother and easier to distribute your web applications. More information about the features and changes you will need to address when migrating from ASP.NET Core 1.x to 2.0 can be found in our documentation. With this release of ASP.NET Core, we are introducing a new coding paradigm that makes writing page-focused scenarios easier and simpler than our current Model-View-Controller architecture. 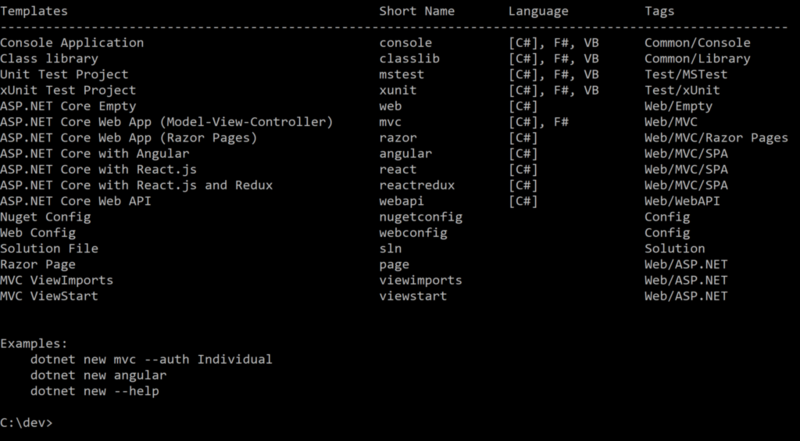 Razor Pages are a page-first structure that allow you to focus on the user-interface and simplify the server-side experience by writing PageModel objects. For more information, check out the ASP.NET Core documentation on getting started with Razor Pages. You can read more information about the updates included in Entity Framework Core 2.0 online in their announcement post. ASP.NET Core 2.0 runs with no modifications necessary on Azure App Service and comes with integrations that provide performance profiling, error reporting, and diagnostics from Azure Application Insights. In Visual Studio 2017, right-click on your project and choose “Add – Application Insights Telemetry” to start collecting data from your application. 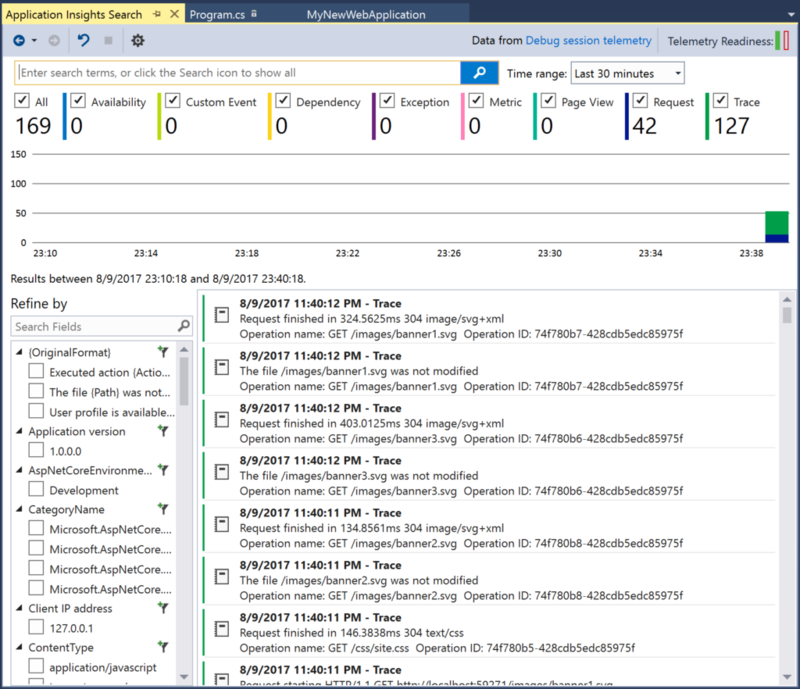 You can then review the performance of your application including all log messages directly within Visual Studio 2017. When you click through that banner, you will create an Application Insights service for your application and attach those features without recompiling or redeploying. Shortly afterwards, your new Application Insights service will start reporting data about the activity captured. Nice! We can go one step further and click that “Download Snapshot” button in the top corner to start a debug session in Visual Studio right at the point this exception was thrown. What about the performance of these pages? 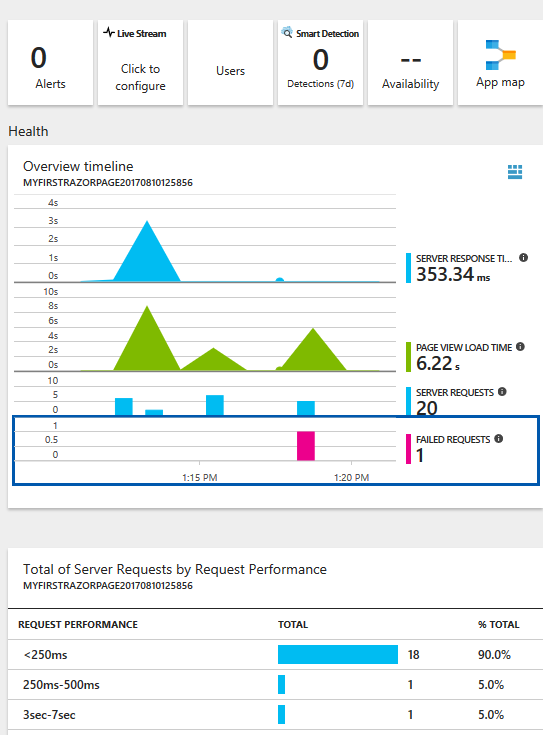 From the Application Insights blade, you can choose the Performance option on the left and dig deeper into the performance of each request to your application. There are more details available in our docs about performance profiling using Application Insights. If you want the raw logs about your application, you can enable the Diagnostic Logs in App Service and set the diagnostic level to Warning or Error to see this exception get thrown. Finally, choose the Log Stream on the left and you can watch the same console that you would have on your developer workstation. 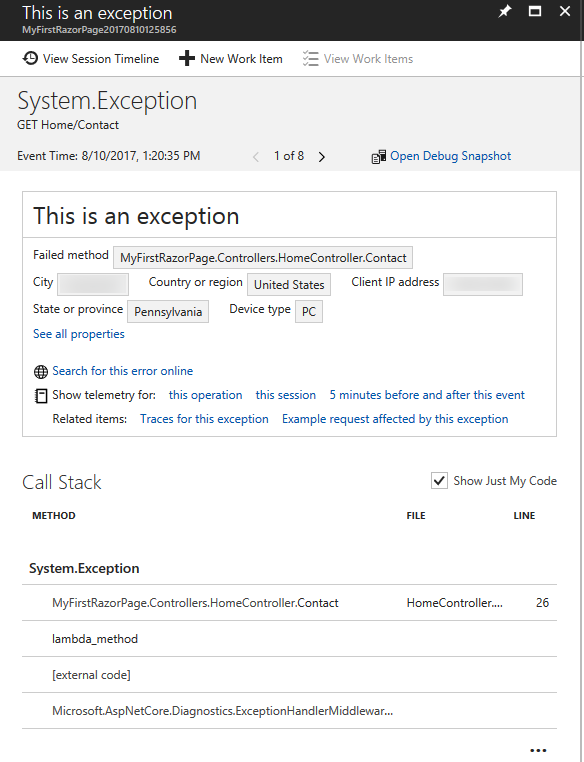 The errors and log messages of the selected severity level or greater will appear as they are triggered in Azure. All of the Application Insights features can be activated in ASP.NET Core without rebuilding and deploying. Snapshot debugging requires an extra step and some code to be added, and the configuration is as simple as an extra NuGet package and a line in your Startup class. 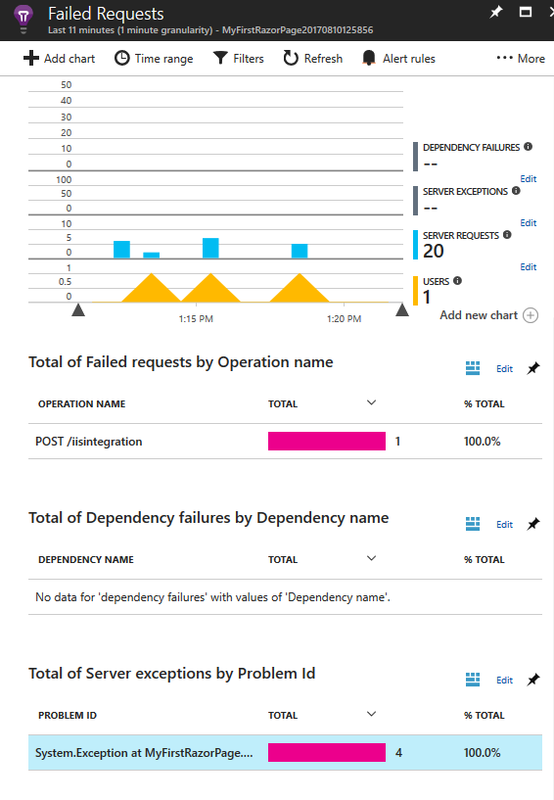 You can learn more about Application Insights Telemetry in our online documentation. 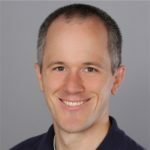 That reduces the possibility of accidentally breaking some of the standard configuration that most developers were not altering in their ASP.NET Core applications. Why make you write the same boilerplate code over and over, when it could be simplified to 3 lines of code?